Within these simple words lies a considerable challenge, and not just for excitable children on a visit to Fatima. It is this: How well do we express our discipleship of Christ every day? How are we getting on in those two ways of giving time to the Lord and to others: in those areas of prayer and sacrifice? Our response to this challenge can be guided and sustained by what we know of Our Lady of Fatima, and what she has to say to us. I would like to focus on two ways in which Our Lady of Fatima has a strong relevance to us today. The first is devotion to the Immaculate Heart of Mary. To understand this well we take as our starting point the closing words of today’s Gospel: ‘I am the handmaid of the Lord,’ said Mary, ‘let what you have said be done to me.’ What Our Lady is expressing here is an attitude of the heart. As Pope Benedict has reminded us, ‘In biblical language, the “heart” indicates the centre of human life, the point where reason, will, temperament and sensitivity converge.’ Mary is saying ‘yes’ with her reason, her will, her emotions: her whole being. Devotion to the Immaculate Heart of Mary is a way for us to say ‘yes’ too, ‘yes’ to an attitude of heart that accords with Our Lady’s, and so opens up pathways, fresh and sure, towards Christ. This is why today we consecrate ourselves, our entire lives, our country to the Immaculate Heart of Mary, so we can always be saying ‘Yes’ to the Lord, with all our heart with all our will, from the centre of our being. Only Mary can teach us how to do this. To cultivate such an attitude of heart is, to put it mildly, the work of a lifetime. We need practical support along the way. And that is where another aspect of the message of Fatima can be so helpful. The recitation of the Rosary. ‘The Rosary is my favourite prayer,’ Pope St John Paul once said, ‘a marvellous prayer. Marvellous in its simplicity and in its depth.’ At its heart are more words from today’s Gospel: ‘Hail Mary, full of grace, the Lord is with thee.’ If there are times when the depth of the prayer may seem too much for us, we can focus on the simplicity. We can know that as we constantly greet Our Lady in the words of the angel, the very fact that we are making time to pray is something of great value to her Son. We are participating in the ‘prayer and sacrifice’ of which Pope St John Paul spoke. I learned to pray the Rosary as a child at home. As a family we prayed the Rosary together. I can still see the pattern of the chairs at which we were kneeling. Concentrating on the prayer was not always easy but we were trying. That’s what counts. How much I wished that every family finds time to pray together. What a difference that would make! And this prayer is needed. Pope St John Paul reminds us that the century since 1917 has seen ‘wars in so many parts of the world, concentration and extermination camps, gulags, ethnic cleansing, terrorism, kidnappings, drugs, attacks on unborn life and the family’. The Church, too, has had her share of troubles. Things can seem very complicated. 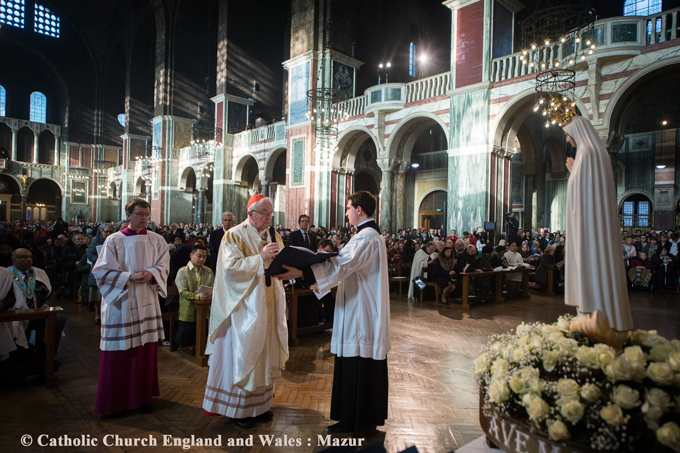 At times when the ills of the world or the Church, or our own situations, weigh heavily on us, we could remember a lovely phrase of Pope Francis, ‘Mary’s faith unties the knot of sin.’ Speaking when the statue of Our Lady of Fatima visited Rome in October 2013, he used the words of St Irenaeus to explain further: ‘the knot of Eve’s disobedience was untied by the obedience of Mary; what the virgin Eve bound by her unbelief, the Virgin Mary loosened by her faith.’ Today’s Gospel reading is, in a way, the antidote to the First Reading, just as obedience and faith are an antidote to disobedience and unbelief. At times when the knots of life seem particularly tangled, when the knots of sin are tied tightly in our lives, we do well to turn to Our Lady and seek her intercession. 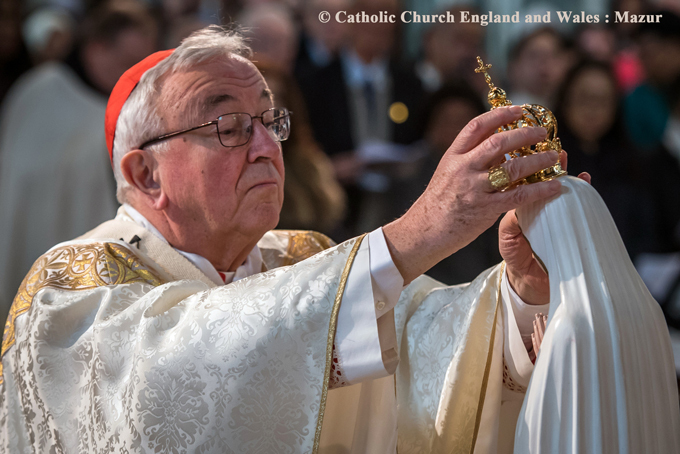 The statue of Our Lady of Fatima, present today in the Cathedral, is on a journey around the cathedrals of England and Wales in the coming months. I pray that this will be a time of grace for many, as they honour Our Lady of Fatima in this centenary year. There is another journey I want to speak about, too, a journey which was over in a split second. It was a journey, not of a statue, but of a bullet. Nineteen years, to the day, before Jacinta and Francisco were beatified, this bullet sped on its way. It was, as many of you will have guessed, the one fired by Mehmet Ali Ağca as he sought to assassinate Pope St John Paul in St Peter’s Square. That bullet was subsequently retrieved and sent to Fatima. Then it was placed within Our Lady’s crown at the shrine. 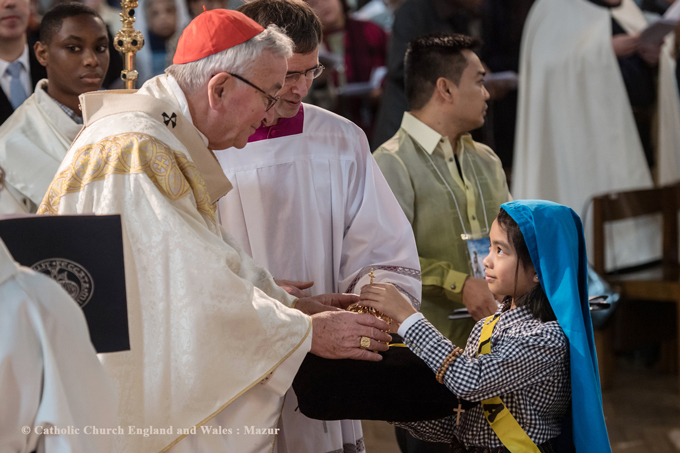 This journey, from an instrument of death to a beacon of reconciliation and hope, is a wonderful allegory of how the prayers of Our Lady and the faith of believers are far, far more than a nice idea. They can truly change the world. Devotion to the Immaculate Heart of Mary, so central to the message of Fatima, can only begin in our own hearts. ‘The heart open to God… is stronger than guns and weapons of every kind.’ So wrote the future Pope Benedict. They are words that we do well to make our own as, this year, a second century of the story of Fatima begins. Our Lady, Queen of Peace, pray for us; Our Lady of Fatima, pray for us. 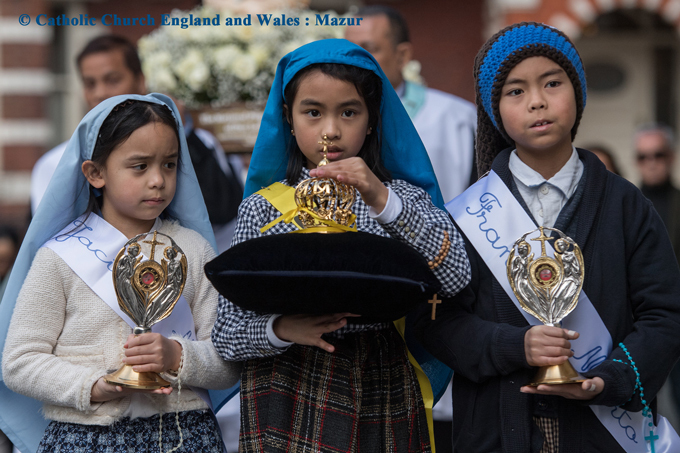 See also: Dates of the visit of the statue and relics of Blesseds Francisco and Jacinta Marto to Cathedrals in England & Wales during 2017.